Today I turned on my computer in the morning, then I went to play a game and maybe 10-15 mins while in the game the computer turned itself off. Try to turn it on and wouldn't turn on. Then 1 minute after turned on again. Then maybe almost 1.5-2 hours after finishing my game the computer turned itself off again but this time I didn't try to turn it back on since I decided maybe needed some cleaning, checking cables, etc. While I was waiting maybe 3 mins after the computer turned ON by itself! What could be the problem? I haven't installed anything and temperature readings seems fine. Today It happened again and twice! same as yesterday! now it's running fine like yesterday for the rest of the day. This is weird, why this is happening and twice again? These are the logs from today, 6 mins apart! Posting your complete system specifications would be of more help than those events. Horrible power supply. Depending upon how old that power supply is it may be putting out an excessive level of ripple that will result in system instability. Even when the Cooler Master eXtreme Power Plus 500W was new it would output a level of ripple that exceeds what is allowed by ATX12V specs if there is an attempt to draw more than 400W. As the power supply ages that wattage level where the ripple is excessive keeps dropping. Your power supply may have now reached that point. Test with a better power supply. Borrow one for testing if you have to. I got the power supply less than 2 years ago. My main question is: why this is happening only in the morning when I first turn on my computer? the rest of the day the computer runs perfectly, I can even play games, edit videos, etc. Some component is temperature sensitive. How could I make a test to see if It's the power supply without getting a new one? 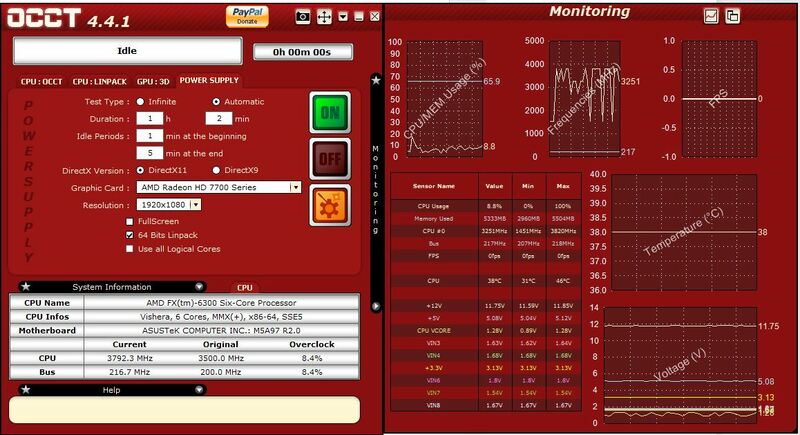 Hi, could you please check if this PSU stats from OCCT are OK? Most obvious is that the +12V and +3.3V rails drop below what is allowed by ATX12V specs. The graphics card gets all of its power from both of those rails. The CPU gets all of its power from the +12V rail. Do you think that it's due to the many reboots? or maybe the culprit is something else? Here are the values from OCCT after restart. What are your recommendations? I really appreciate all your help. Try using a better quality power supply unit. If a PSU has insufficient hold-up time it can actually cause disk corruption because the SSD or HDD will not have sufficient time to flush its cache contents to storage before the stored charge runs out in its primary capacitor(s). I'm going to order a new Corsair 600w power supply from Amazon. Do you think it's fine to leave my computer ON all the time while I get the new PSU? Don't get a Corsair CX600 or CX600M because their hold-up time is only 6.8 milliseconds. The ATX12V Power Supply Design Guide says that the minimum hold-up time needs to be 16 milliseconds or longer. What would be the main problem I could encounter with this limitation? What country are you in? What is the budget limit? What brands and models do you have available to choose from? Thanks! that one looks good. Where did you find the complete specs? XFX has most of the specs on their website. 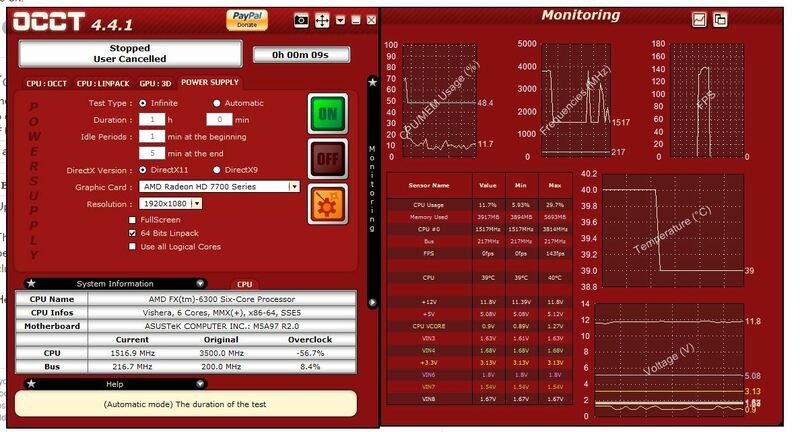 The hold-up time is from a German review site when they reviewed that specific PSU model. Today when I woke up the computer was off, I remember waking up around 3am and the computer was working. 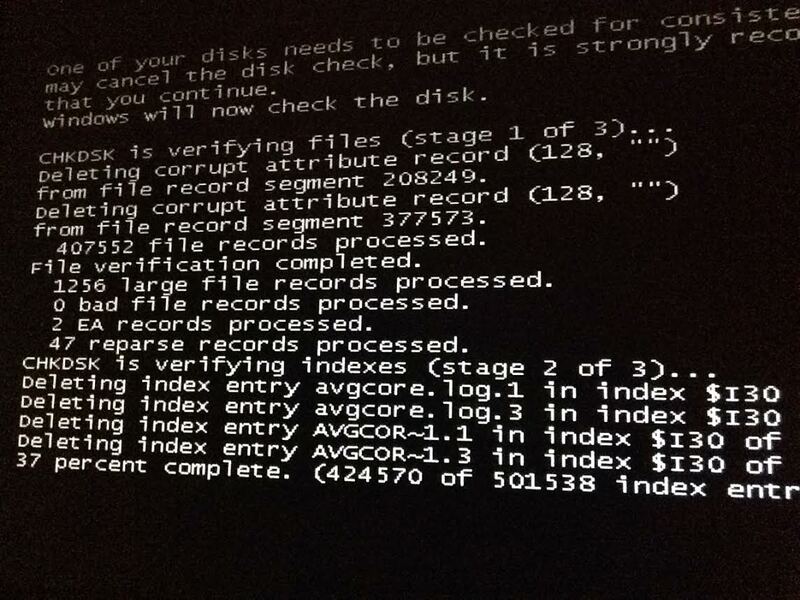 The strange thing is that it decided to turn off completely instead of reboot. After turning the computer ON the reboots started again, so I took everything apart and discovered that the PSU fan wasn't working. It was stuck. I cleaned everything up and the fan is spinning but slowly. I ended up buying the XFX PSU that you recommended me. Good thing is that I needed a few things from Amazon as well! I'm going to let the old PSU run for a little bit and see If I can make it run until I get the new psu. The Cooler Master eXtreme Power Plus 500W uses a very cheap PROTECHNIC made MGA12012HS-A25 sleeve bearing fan so it's no surprise if it fails early. Hello, I finally was able to get the PSU delivered. Everything is working great! but the 3.3 V still showing 3.13V, same as before, maybe the sensor is giving out incorrect info. Also something weird happened today. I left the PC on then I left for a few minutes, when I came back everything was frozen, I couldn't click on anything and CTRL ALT DELETE didn't work. I had to reset the PC using the power button. After that event Chrome seems different, everything is working right but not responding immediately as before. Sometimes I have to click twice to get it to work. Do you think this is related to the change or just a coincidence?